Every Friday in the main hall of the Oliver Bird Hall from 9.30 am onwards. A time of fun and fellowship for parents and carers and their children aged 0-5. Come along and chat, play, eat biscuits, sing action songs and explore a bible story. No need to book but if you want to know more email Linda Hicks or phone on 0121 270 7390. Join us for some Messy Fun with crafts, celebration time and hot tea. Usually on the second Friday of the month from 4-6pm at St Helen’s Church, St Helen’s Road B91 2DA. The latest dates and times can be found our Facebook page. Come along and talk about the really pressing issues of modern day living that impact on Christian family life. A safe space to share time with friends and build relationships. There’s plenty of good coffee (or tea) posh biscuits and brioche. Don’t worry if you need to bring a little person with you as there will be toys (and people) for the children to play with while you enjoy a drink and a chat. Tuesdays in term time in the main hall of the Oliver Bird Hall. Just come along or for more information email Linda Hicks or phone on 0121 270 7390. St Alphege Kids is the group for primary school aged children in the church building, meeting during the 9.15am Parish Eucharist. Children leave after the opening prayers and return to their families for Communion. The group is led by volunteers, all of whom are DBS checked. All are welcome. Parents are welcome to stay, but many remain in the main church for the readings and sermon. After Communion, a craft table and flags (during the last hymn) are made available for children. We are a vibrant group, ranging from 8-20 children on any one Sunday. Currently we are following the Diddy Disciples series, using a mixture of song, story and craft to learn about the Bible and God’s good news for us. Come and join us! The Puppets at a social event in the OBH. 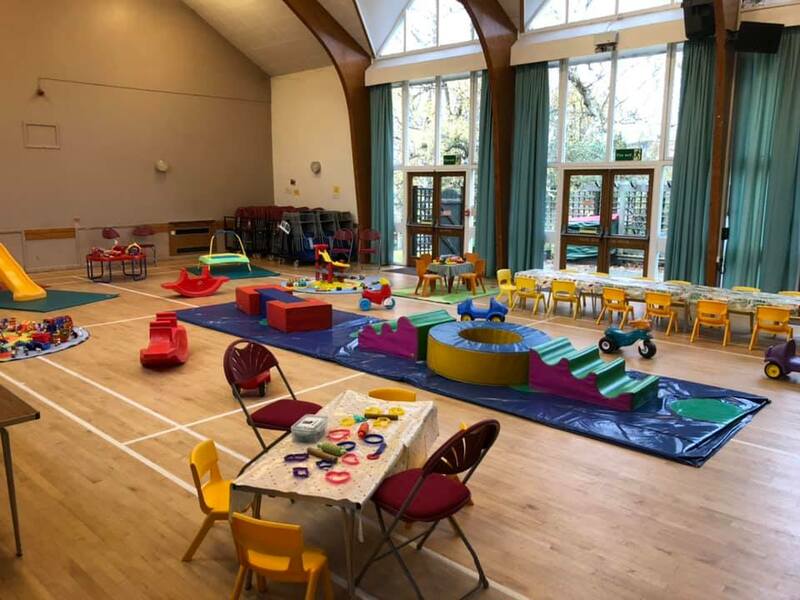 Solihull Parish Puppets is a group of people who love working together to plan, rehearse and finally perform sketches and songs using a variety of puppets, including arm rod puppets, Sockettes (sock puppets) and stick puppets. We meet on Thursdays at St Helen’s Chapel, St Helen’s Road, B91 2DA, 6.30-7.30pm during term-time to plan and rehearse our performances. We have a lot of fun together, developing our skills and trying out new ideas. We are particularly grateful to members of our church who have helped with recording sketches and making costumes and props. To date, we have performed at the different churches within the Parish, but would be interested in performing at other locations too. We are currently a small group of eight, but would love to have more people join us, especially as our young adult members prepare to move on to university, for example. If you are interested in becoming a member of Solihull Parish Puppets, or feel that you could support us in an alternative creative way, then please do get in touch with Ruth Sabbagh, on 0121 705 3088 or 0791 2626315 or alternatively, with Linda Hicks, on 0121 270 7390 or 07838 670772.